Born in Hamburg, Pennsylvania, Arlington Lindenmuth lived most of his life in Allentown. A largely self-taught painter of impressionist landscapes, portraits, theatrical scenery and murals, he was also a well-known photographer and traveled widely as a representative of the Eastman Kodak Corporation. Lindenmuth studied with his wife's cousin, artist Peter Gross, and for a period in Europe. Lindenmuth painted local scenes as well as in Woodstock, New York. 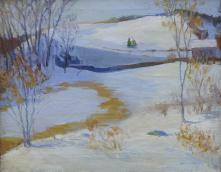 He exhibited in New York and Philadelphia as well as with the Baum School of Art and the Lehigh Valley Art Alliance. A strong supporter of the arts in the Allentown area, he had a studio that was the site of the first exhibition held by the Fine Art Club of the Lehigh Valley (1922). A close friend of Walter Baum, Lindenmuth was one of the first people to propose establishing an art museum in Allentown (1912). He taught classes in his studio and ran his own summer school. He was the father of artist Tod Lindenmuth. Among his students who later became important artists, were John Berninger and Joseph Meierhans.